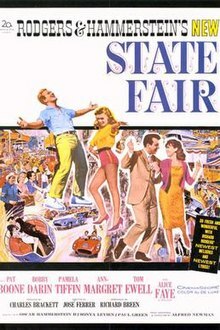 State Fair is a 1962 American musical film directed by José Ferrer and starring Pat Boone, Bobby Darin, Ann-Margret, Tom Ewell, Pamela Tiffin and Alice Faye. A remake of the 1933 film State Fair and the 1945 State Fair films, it was considered to be a financially and critically unsuccessful film. While the stage musical, 1933 and 1945 film were set at the Iowa State Fair, this 1962 version was set in Texas (the family drives through Dallas where the State Fair of Texas is held.) It was filmed in Visalia, California at Mooney's Grove park. The Tilt-A-Whirl that was used in the film is currently at a small theme park in Golden, Colorado. José Ferrer had just made Return to Peyton Place for Fox and was signed to direct. ^ FOX WILL REMAKE 'STATE FAIR' FILM: New Rodgers-Hammerstein Songs Slated in 3d Version -- Studio Plans Busy Year By MURRAY SCHUMACH Special to The New York Times.. New York Times (1923-Current file) [New York, N.Y] January 5, 1960: 28. ^ Rodgers Will Write Own Lyrics After 42 Years of Collaborating: Composer, Shaken by Loss of Hammerstein, Will Attempt to Go It Alone for Film By ARTHUR GELB. New York Times (1923-Current file) [New York, N.Y] September 22, 1960: 29. This page was last edited on 15 September 2018, at 17:33 (UTC).